- Dr. Walter V. Pierce, Sr.
Pierce Chiropractic Center was founded in 2017 by Dr. Randy Culig and Dr. Sam Wireman. After meeting at Life University and discovering a mutual passion for scientific, evidence-based patient care, they knew it would be a perfect fit to open a practice in Midtown Atlanta together. Their meeting was thanks to the Pierce Results System club at school. 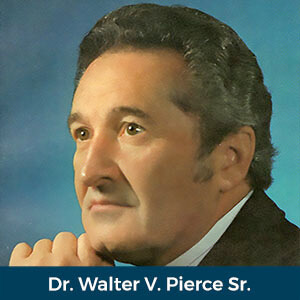 Dr. Culig’s grandfather, Dr. Walter V. Pierce Sr., was the creator of this technique, laying a strong foundation to advance and grow the chiropractic profession with new technology and improvements to patient care. At Pierce Chiropractic Center, we approach our care based on the vision of Dr. Pierce, Sr. You’ll be able to see objectively the progress you’ve made, and the changes present rather than simply feeling the difference. With our cutting-edge techniques and equipment, all findings of our comprehensive evaluation are thoroughly analyzed to provide you with the most effective care possible. The progress of your care is checked each step of the way utilizing spinal imaging, thermography and a detailed structural examination of your body’s posture. Corrections are performed using the Pierce Results System and Orthospinology – an advanced upper cervical technique. Making for a gentle, precise approach — no twisting, cracking or popping. If you’re ready to get started, contact our Midtown Atlanta chiropractic care center today! We offer risk-free consultations.